If you don’t get a single damn thing from the minutes sandwiched in between Menashe’s beginning and ending, then at least the beginning and ending tell you everything that you need to know: Conformity is a sacrifice. You should, of course, get plenty from the rest of the film, regardless how close you are or aren’t to Orthodox Judaism. Like the Coen brothers’ A Serious Man, proximity to the culture is less important than basic human decency and empathy for people who don’t have full control of their own lives. Menashe, the title character, played by Youtube comic Menashe Lustig, instantly reads as sympathetic, well-intended, kindly and most of all, fatherly to his son. After the death of his wife, Menashe has flown solo as a parent, pressured by his community to remarry and by his unforgiving brother-in-law to let the boy stay with him. (The community, it’s worth noting, is on the side of the brother-in-law on that matter.) Centrally, Menashe engages that struggle, which just so happens to be the same struggle Lustig faces in his actual life. It’s fine if you don’t know much about Hasidic Jewish society. 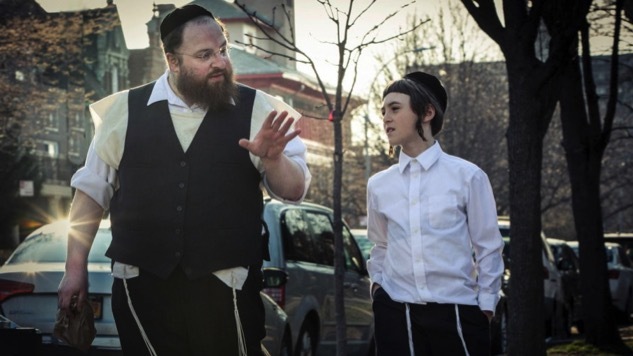 It’s fine if you’re surprised to hear about the roadblocks director Joshua Z. Weinstein dealt with, trying to film Menashe in New Square, a Hasidic district nestled within the bosom of Brooklyn. These are immaterial. You only need to understand that Menashe is a father who believes he knows best, and believes he is fit to rear his own kid, and also that the world he inhabits disagrees. If the particulars that define Menashe’s turmoil stem directly from his culture, then the turmoil itself remains familiar, but do make an effort at engaging with that culture as Weinstein has done: It’s the least you can do, and frankly you don’t have much of a choice. Menashe’s spoken dialogue is mostly Yiddish. But the language is, in part, what makes Menashe such a special experience, though. We’ve all watched films made in languages other than our own, whether French, Japanese, Spanish, British English, Japanese, German; the sensation of not apprehending what’s being said on screen sans the aid of subtitles isn’t new. New is hearing a cast of actors recite Ashkenazic dialect. Depending on where you live, Menashe might be the first time you’ve been fully exposed to it, which is just my coy way of saying that if you can see Menashe, see Menashe. The film has more going for it than curiosity, of course. Notably, there’s Weinstein’s verite style of filmmaking, which positions him not as a fly on the wall, but as something of an accomplice to Lustig, or perhaps a provocateur. Shooting in New Square, in full view of its Hasidic populace, is a risk, particularly in light of the rabbinical restrictions and cultural expectations imposed upon artistic endeavors. (Odds are good that few, if any, Hasidim will end up seeing the film for themselves, and if they do, they’ll have to leap through the exact same hoops as Lustig to justify participating in its existence.) But Weinstein has a careful, delicate touch; he isn’t invisible, but he doesn’t announce his presence, which is how the best neorealism functions anyway. He’s no Rossellini, but he might be a De Sica. Regardless, he’s great behind the lens, orchestrating all the film’s action without a trace of vanity or showmanship. His quiet direction speaks volumes. This is especially true when considering his star. Lustig is a big man who can’t help announcing his presence, whether he’s merely walking through New Square crowds in partial Hasidic dress, or whether he’s bursting forth from his hiding spot of cardboard boxes while playing hide and go seek with his son during work hours. If there’s one word that properly captures Menashe, and by extension Lustig himself, it’s “lovable.” Sure, his Hasidic peers, from friends to family, might not cotton very well to him—they regard him with a mix of befuddlement and disdain—but everyone else, notably his Latino coworkers, can’t help but smile in his company. He’s a good man, but his goodness is of a sort that isolates him among his people. At home, on the job, even in a spiritual environment, he’s an outsider. Menashe is all about capturing the painful dynamic of feeling completely alienated, even when you’re in a room surrounded by people just like you. (This is best dramatized when he sets out on a horrifically awkward blind date.) Because Lustig is naturally funny, the movie is infused with gentle humor too, shared most often between Menashe and his son. But the humor is only a temporary reprieve from the larger problems haunting Menashe’s door: His refusal to submit to terms he deems unacceptable for governance of his son, and what that says about him as a dad, a man, and, for better or worse, a Jew. The result is a sharp, moving dissection of personal identity and self-agency. You don’t need to know Yiddish to make sense of that.